“Oh the good old days”! Dave has been in the financial service business for 30 years helping clients grow and protect their hard earned savings from taxes, long-term illnesses, and unnecessary investment risk. When working with a retiring client, he would offer guidance in their pension options, review their Social Security benefits and suggests readjusting their investments to be a little more conservative. He would deal with the possibility of a long-term illness many times recommending the purchase of long-term care insurance or removing some of their savings into a trust so they could start the 5 year look-back. Dave would explain that retirement planning was like having a 3 legged stool; pension, Social Security, and savings. Most retirees could live off their pensions and Social Security and have fun with their savings, buying 2nd homes, spoiling the grandchildren (if they didn’t disappoint them yet), traveling the world during their go-go years, cruising during their slow-go years, and getting expanded cable TV during their no-go years. At 65 years old, a retiree has an average 15 years to live and plan for. “Oh the good old days”! Todays retirees for the most part have no pension, but in a lot of cases have more retirement savings thanks to 401k’s and IRA’s. Dave explains to them that they have a 2 legged stool, Social Security and retirement savings and that it is much more difficult to balance a retirement now expected to last 25 to 30 years. The biggest challenge with their retirement savings leg has been fluctuations in the stock market and interest rates making it difficult for most to feel comfortable with how much they can expect to receive, having a pension would make retirement much more enjoyable. Due to Dave’s clients struggling to figure out how much retirement income they can take knowing that a mistake at this point in their life could mean learning a new phrase “Welcome to Walmart”. 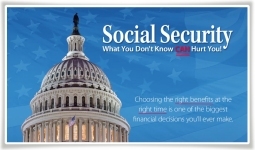 Dave has taken the time to study Social Security and have found there are many ways to get more out of it without putting more in. As a result, he has helped many clients to make their Social Security elections that on average will result in tens of thousands of dollars in more benefits over their lifetimes. By showing them how to increase their Social Security benefits by just 10 to 20%, it takes a lot of pressure off a person’s retirement savings. Dave teaches people how to properly time their Social Security benefits and how to position their retirement savings to have an inflation adjusted worry free retirement plan. Dave believes people need to start retirement planning with an income goal and then time Social Security and place assets properly to obtain it. It all started for them by attending one of Dave’s free “Maximize Your Social Security Workshop” at this informative workshop, they learned about strategies that help single, divorced, widows and married couples get the most out of Social Security. Generally, the workshops are held at local libraries or senior centers. As a client gets closer to retirement, Dave enters the picture. Dave is able to show them that with proper discussion on receiving their Social Security benefits, coupled with their existing assets, that a stress-free retirement can be achieved. He will further provide his clients with a clear and concise written plan. This plan can be adjusted in the future as circumstances arise.